The idea behind this is: When an accident occurs, the energy of the accident enters the body. This fits with the laws of thermodynamics, which tell us that energy cannot be created or destroyed. They also tell us that the natural tendency of atoms, molecules and energy is toward disorganization. When this external, disorganized energy - the "energy of injury" - is forced into the body, it penetrates into the tissues to a depth determined by the amount of force versus the density of the tissues. This force is countered only by the density of the tissues it is trying to penetrate. A blow to the foot or ankle might penetrate through the leg all the way to the pelvis. Once it reaches its depth of maximum penetration, it stops and forms a localized "ball" of energy that doesn't belong there. If your body is vital and able, the "energy of injury" can dissipate and normal healing can occur, but if your body is unable to dissipate this energy, it is compacted into a smaller and smaller ball in order to minimize the area of disruption to tissue function. As it becomes more compressed and localized, the disorganization within this compressed energy increases until it becomes an "energy cyst." A person can adapt to energy cysts; however, over time, the body needs extra energy to continue performing its day-to-day functions. As years pass and the body becomes more stressed, it can lose its ability to adapt. This is when symptoms and dysfunctions begin to appear and become difficult to suppress or ignore. Fortunately, a technique called "Energy Cyst Release" can help the skilled therapist deal with these particular challenges. It is an effective way of encouraging your client's body to release those areas of blocked energy and accelerate a full recovery. Energy Cyst Release is a component of CranioSacral Therapy, which addresses restrictions in the craniosacral system that surrounds the brain and spinal cord. 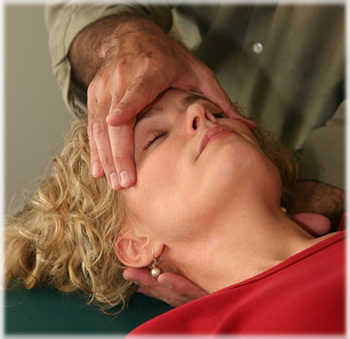 Using a light touch, the practitioner monitors the rhythm of the fluid coursing through the craniosacral system to detect potential restrictions and imbalances. Delicate techniques help release those problem areas and relieve undue pressure on the brain and spinal cord. As part of that process, the body will sometimes spontaneously return to the same position it was in when the injury was first sustained. As this occurs, the therapist can feel the tissues of the body relax as the energy cyst is expelled. Then the body is free to fully return to its optimal levels of functioning. This is what happened after a woman named Rebecca* was involved in a severe automobile accident. She visited a CranioSacral Therapist to help relieve the constant pain she had experienced for eight months. Though her fractures had healed, she was left with severe headaches that occurred almost daily, and her neck and lower back hurt constantly. The therapist first tried to find a structural reason that would account for the severity of the pain. Restrictions were cleared in her craniosacral system, which helped with her head and neck, yet her back continued to hurt. During the tenth session, Rebecca was seated on a treatment table with her back to the therapist. He had one hand on her back and the other on her head as he tested the spine for subtle movements. Suddenly, Rebecca began to push hard against the hand on her back. After a few minutes she slumped forward. Rebecca reported that she had suddenly remembered an incident several years earlier when she was hit by a fist in the middle of her back. The resistance she felt from the therapist's fist enabled her to release the energy of the blow and of the accident injury spontaneously. Her life turned around after that session. Within a month, her pain was minimal. This is a case in which the tissues had been released, but the energy cyst still resided within them. By returning her body to the precise position it was in at the time of injury, the mass of disorganized energy that had been forced into the tissues from the original trauma was suddenly given an escape route, which was also the same route of its entry into the body. It is possible, after you've become experienced practicing these techniques, to release energy cysts without using the client's body position as the facilitating factor, but that approach requires a lot more work on your part, and it is much less natural. It is always better to work with the client's body, than against it.